Lucio’s new legendary skin for the Overwatch one year anniversary is causing me physical pain. It doesn’t really help that Lucio has mostly been portrayed as either an athlete or a musician. On the one hand, Lucio is canonically a Brazilian DJ—of course his skins reference music. The soccer skin also comes from the Olympics event, which was hosted in Brazil. To say that soccer is huge in Brazil would be a massive understatement. The Olympics event also gave us Lucioball, a game mode that turned Overwatch matches into a stylized game of soccer. But in a larger cultural context, it doesn’t feel great to see that he’s largely been portrayed in those ways. It can be difficult to explain why portrayals of black men as athletes or entertainers can ruffle feathers—it’s really not about role, but the frequency with which black men are placed in it. Jordan Peele’s horror movie Get Out offers a thorough dismantling of the way that culture at large values black men for being particularly good at sports or music. In that movie, while the main character is at a party, the guests ask him what sports he plays. A villain explains that he admires black people for their strength and stamina and creativity, to the point of wanting to steal their bodies. This is an American framing and an American problem, but Blizzard is an American company and developer. Even if Lucio as a character is Brazilian, he’s created in a space where American stereotypes come into play. It doesn’t offend me or make me outraged, just a little tired. Honestly, Lucio’s best skin is the Christmas elf. That one’s adorable. Look at his little hat! Lucio’s new anniversary skin continues the trend of bad skins. It’s called “Jazzy,” and presumably that means he’s a jazz musician. 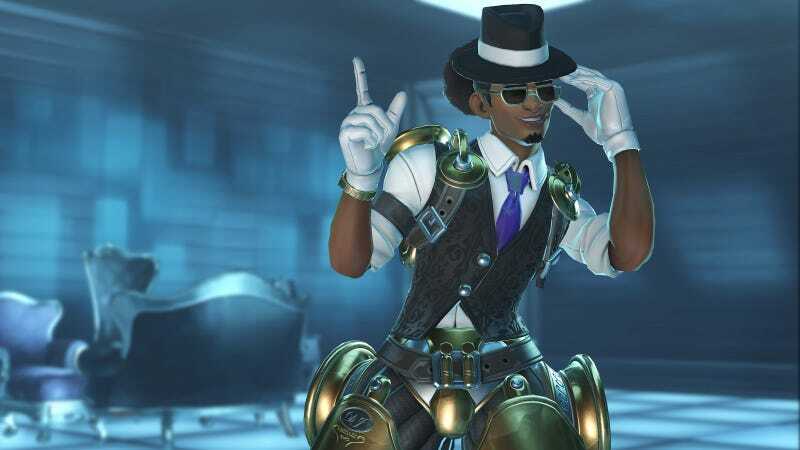 To me, Lucio looks like he’s doing Bruno Mars cosplay. Really, Lucio’s skin is a lesson to people who want to venture out into the worlds of fashion for the first time. Statement pieces like hats, vests, gloves or golden codpieces need room to breathe. If you wear too many at the same time, you look like you’re playing dress up in your parent’s clothes. So next time you go shopping remember this: You might get excited and buy a bunch of cool accessories, but for god’s sake, don’t put them all on at once. This is what you look like.